A national award for education has gone to Leslie Jones, here with O’Hara students Scarlett O’Neill, Grace Martin, Amanda Dietmeyer, Robert Westover, Jaxen Mazur, Owen Walsh and C.J. Martin. EUGENE — Leslie Jones of O’Hara Catholic School will receive the 2017 “Lead. Learn. Proclaim.” Award from the National Catholic Educational Association for dedication and commitment to excellence. The annual award honors teachers who have demonstrated a strong Catholic educational philosophy as well as exceptional ability, dedication and results. The teachers, chosen from the more than 150,000 educators in the nation’s Catholic elementary and secondary schools, will be recognized during the annual NCEA 2017 Convention and Expo April 18-20 in St. Louis, Missouri. 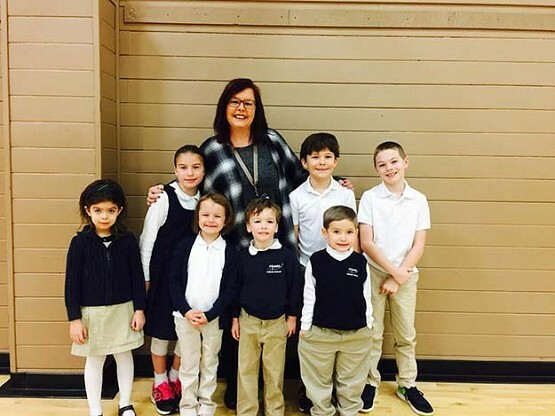 Jones is the campus minister at O’Hara, where she coordinates religion classes, teaches, leads retreats, arranges liturgy, ministers to middle school youth and leads a Mass 101 class designed for families interested in learning more about Catholicism. O’Hara serves more than 500 children from the Eugene-Springfield area. “Her outreach has strengthened the bond between the school and the family, ensured the Catholic identity of the school, and enhanced the religion curriculum for every grade,” says a statement from the school. Jones has fostered relationships with the community to establish school-wide service learning opportunities. James Pavlacka, director of leadership development at NCEA, calls teachers the backbone of the Catholic educational system, which comprises more than 6,000 Catholic elementary and secondary schools across the nation. “The excellence that these teachers display is an inspiration to all of us who work in Catholic education,” Pavlacka said.